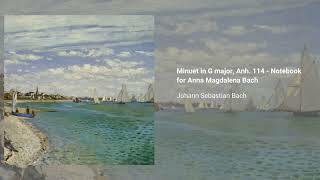 The Minuet in G major is a keyboard piece included in the 1725 Notebook for Anna Magdalena Bach, attributed until recently to Johann Sebastian Bach, and listed in the Bach-Werke-Verzeichnis as Anh. 114 (which catalogues it as a dubious work). It was eventuallyidentified as part of a suite by Dresden organist Christian Petzold. The Minuet in G major is usually performed with its companion piece, the minuet in Gm (catalogued as Anh. 115).